First published Canberra Times September 18 2013. Bobotie is a national food icon to South Africans, sometimes described as a South African moussaka. It is best described as a light textured meat tart, flavoured with typical Cape Malay spices and fruit, then topped with a savoury custard. The dish first appears in a Dutch cookbook in the early 1600s, and makes its way to the Cape Colony sometime in the seventeenth century. Dutch East India Company trading ships returning from the Spice Islands to Holland via the Cape of Good Hope brought the first Malay slaves, and their spices, to be added to the mix. Dutch colonists and migrant Indians also have a hand in its development and the result is a truly multicultural experience, with just the right balance of sweet, sour and spicy. 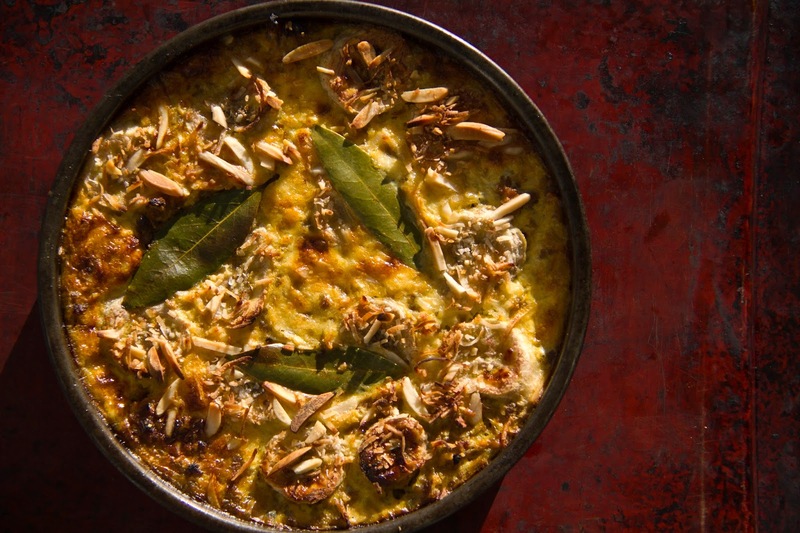 The variations of Bobotie are pretty much endless, but generally contain the wrap-around signature spice flavours with a selection of meat, fruit and topped with an egg custard and nuts. I chose the traditional beef mince, apples, curry, bananas, almonds and coconut for my dish, a combination that improves if left in the fridge overnight and warmed up the following day. Grease a twenty centimetre ovenproof pie dish. Heat the olive oil in a large frypan over a medium heat. Add the chopped onions and fry until soft. Add the curry paste and other spices, salt and pepper and fry for an additional minute. Add the beef mince, breaking up and cooking until browned. Add the mashed bread and milk mixture, tomato paste, grated apple, raisins or sultanas, chutney, lemon zest and juice and the garlic. Fry for a few minutes until combined on a medium heat. Transfer the meat mixture to the greased pie dish and top with sliced banana. Lightly beat the milk and eggs together with a fork and pour the custard mixture over the pie. Top with slivered almonds and shredded coconut and lay the bay leaves on the top. Bake in a 200c oven for twenty five to thirty minutes. Serve with boiled rice cooked with half a teaspoon of turmeric. Bobotie can be eaten warm or at room temperature and flavours are best if eaten the following day.